QuickBooks is a popular accounting software suite and is among the most widely-used worldwide by small businesses, startups, freelance bookkeepers, independent accounting firms, and large companies. Offering robust tools for expense tracking, tax calculation, invoice management, and sales monitoring, this best-in-class software is purpose-built to simplify accounting and streamline financial management. Now you get all these essentials features QuickBooks is known for plus powerful industry-specific capabilities with QuickBooks Desktop Enterprise. Among its offerings is an advanced inventory management solution. The solution lets you take complete control and full visibility into your inventory in order to help you make better and informed business decisions. You’ll be able to quickly track product and material movement as well as storage. You can track by lot or serial numbers and by bin location to easily find your assets, get precise inventory counts, and avoid shipping errors. It allows you to manage the entirety of your pick, pack, and ship workflow directly from a central dashboard, streamlining the whole process and minimizing paper works and errors. The software’s cycle count feature allows you to take inventory without bringing your warehouse operation to a halt. It enables you to scan and automatically upload inventory counts from various warehouses to a single inventory dashboard. This lets you easily find discrepancies and adjust them, and export or import inventory counts. For more flexibility and insights into your operations, the system can generate customizable reports such as inventory stock by items, inventory valuation summary, and assembly shortage. What makes QuickBooks Desktop Enterprise a class of its own is that you get core accounting features combined with ERP capabilities to manage more than just inventory. The package gives you advanced reporting, sophisticated pricing management, enhanced payroll system, and simplified order fulfillment. All these are integrated into one platform with intuitive tools that can be used even by those with no IT background. What’s more, you get deployment options – install it locally in your office computers or have it cloud-hosted by QuickBooks for any time, anywhere access from any device. 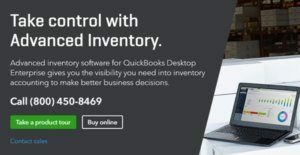 QuickBooks Desktop Enterprise inventory software utilizes a cycle count feature that gives you real-time inventory tracking without having to shut down your warehouse. You can track your inventory in multiple locations and see from each location the number of items on hand, on purchase order, on sales order as well as your reorder point. You’ll likewise be able to transfer your inventory from one location to another location if one of these places is running low on stocks and requires an immediate refill. The system will automatically calculate what items need restocking, giving you full visibility from a centralized dashboard on your stock levels from multiple warehouses. This way, you can quickly find discrepancies and make adjustments between actual and expected inventory. Mobile technology elevates inventory management multiple notches higher. With QuickBooks’ mobile app on your Android device or via a Bluetooth scanner, you can easily track your inventory through mobile barcode scanning. You can do this anywhere there is an internet connection to fast track receiving and picking, lessen errors on data entry, and send sales orders to your people in the warehouse or even to those located in other warehouses. The process is efficient, accurate, and seamless. A new powerful capability of QuickBooks Desktop Enterprise is the enhanced “pick, pack, and ship” which allows you to manage the entire order fulfillment process from one place. It takes just one click for you to move an item from one stage to another – picked to packed and to ship – and send instructions to your warehouse employees. And with a shipping manager feature, you’ll be able to print labels from USPS, FedEx, and UPS directly from the software. QuickBooks Desktop Enterprise lets you tap your employees to fulfill sales orders and by giving priority to orders that need immediate attention. Your personnel can assess this by viewing important information like the value of order, ship date, and inventory availability. It allows you to speed up sales orders through an improved picking process where you can create customized pick-lists that can be completed by your team across multiple warehouses. The system gives you the ability to check sales order status in real time. QuickBooks Enterprise gives you robust inventory reports that you can customize according to your needs. You can put additional fields in the reports for flexibility and better inventory tracking. You can get various insights on many aspects such as your inventory stock by item, assembly shortage by item, inventory valuation summary, and more. You’ll never go dark and will always be updated with critical information and indicators on the status of your items and inventory. It's crucial to realize that virtually no service in the Inventory Management Software category is going to be a perfect solution that can fulfill all the goals of different business types, sizes and industries. It may be a good idea to read a few QuickBooks reviews first as some software may perform well exclusively in a really small group of applications or be designed with a very specific industry in mind. Others might function with a goal of being easy and intuitive and consequently lack complicated elements welcomed by more experienced users. You can also find services that cater to a broad group of customers and provide a powerful feature base, however this in most cases comes at a more expensive price of such a solution. Ensure you're aware of your needs so that you buy a service that has exactly the elements you search for. QuickBooks Desktop Enterprise offers three pricing plans – Silver, Gold, and Platinum. However, the advanced inventory software is only available in the Platinum plan, the price of which varies depending on the number of user licenses and mode of deployment. Below are the starting prices for one user on a cloud-hosted or on-premise plan. We realize that when you make a decision to buy Inventory Management Software it’s important not only to see how experts evaluate it in their reviews, but also to find out if the real people and companies that buy it are actually satisfied with the product. That’s why we’ve created our behavior-based Customer Satisfaction Algorithm™ that gathers customer reviews, comments and QuickBooks Enterprise reviews across a wide range of social media sites. The data is then presented in an easy to digest form showing how many people had positive and negative experience with QuickBooks Enterprise. With that information at hand you should be equipped to make an informed buying decision that you won’t regret. QuickBooks Desktop Enterprise integrates with other Intuit and QuickBooks products as well as with over 200 hundred third-party business apps and services including those for time tracking, CRM, spend management, scheduling, project management, and e-commerce platforms, among others. QuickBooks API is also available for app developers to build integrations between their systems and connect customer data with REST-based API.